The MPL4351 board has been designed as a high performance interface to Ethernet LANs. The Am7990 Ethernet controller and the G-64/96 bus share the same dualport RAM. The Am7990 and the processor communicate via this memory, i.e. initialization data, data descriptors, receive and transmit data are stored in the RAM. For storing the Ethernet address and other possible data an EEPROM is available on the MPL4351. The first words of this EEPROM are programmed with the Ethernet address, the rest are free for User data. 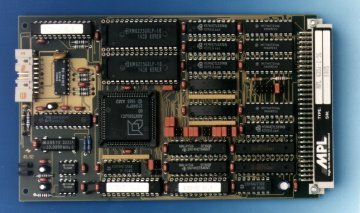 The MPL4351 memory and control registers are accessible through its G-64/96 bus interface in asynchronous mode. The RAM is organized 16 bit wide dualport memory for most efficient data communication with the Ethernet controller chip. As interface to the network a connector is available which permits the use of a direct ribbon cable to attach a standard 15pin AUI connector. This allows the use of 10Base5, 10Base2, 10BaseT or fiber-optical transceivers. Vectored or autovectored interrupts are available for the Am7990 chip. For vectored interrupts the G-64/96 daisy-chain is implemented.